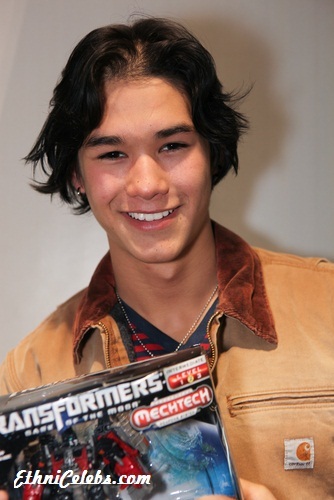 Birth Name: Nils Allen Stewart, Jr.
Booboo Stewart, also known as Boo Boo Stewart, is an American actor, singer, dancer, model, and martial artist. He appeared in the Twilight films as member of the Wolf Pack Seth Clearwater. He was a member of the singing group T-Squad until they disbanded in 2008. Booboo is the son of Renee (Yee) and Nils Allen Stewart, a stuntman and actor. Booboo’s father is caucasian, and is usually described as being of Scottish, Russian, and Blackfoot Native American ancestry. It is not clear if this Blackfoot Native American ancestry has been verified/documented. Booboo’s mother, who is Asian, is said to be of Japanese, Chinese, and Korean descent. WOW! What a mixed bag he is. so cool!! Booboo? Really of all names? Nice mix. I figured he was Eurasian. Japanese, Chinese and Korean? How does that happen? lol At first I was just thinking Japanese and European but the others are interesting. Some Koreans, Chinese and Japanese mated along the ways on his mom side. intriguing background he has. And his dad, Russian and Scottish? That’s rare!